Thanks to Athul Benoy for sending this information in. Heartfelt gratitude for sharing it with other enthusiasts via this Team-BHP page! Skoda has silently launched a special edition of the Superb called the Corporate Edition. 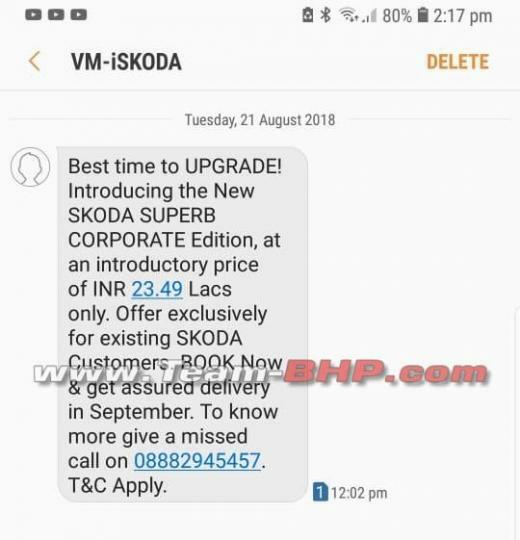 According to a message received by a Skoda owner, the Superb Corporate Edition is available at an introductory price of Rs. 23.49 lakh (ex-showroom). More details about the Superb Corporate Edition are not available at this moment, however it appears to be positioned below the Style 1.8 TSI variant. At present, the Superb is offered in three petrol and two diesel variants with a choice of a manual or automatic transmission. The 1.8-litre, 4-cylinder, turbocharged petrol engine produces 177 BHP and 320 Nm of torque and comes paired with either a 6-speed manual or a 7-speed dual-clutch gearbox, while the 2.0-litre, 4-cylinder turbocharged diesel unit puts out 175 BHP and 350 Nm of peak torque and is offered with a 6-speed dual-clutch transmission.